This form is needed when the landlord and the tenant have decided that the lease shall be cancelled and not be renewed further. The form would make such a decision official and release each other from all sorts of claims and obligations. This form is filled up by both the tenant and the landlord when both of them have mutually agreed upon the fact they do not want to renew the duration of the lease anymore. Forms of such kinds are used when the landlord has given an apartment for rent and now have to cancel the lease agreement with the tenant. The duration of the contract is basically decided upon from the beginning and thus the termination date also remains fixed from the beginning. A commercial lease termination form is the most needed when a landlord has to terminate the rent agreement of his commercial space, that is presently being occupied by some professional organization. This form is required t be filled up in case the tenant has decided to break the contract early. He might have to keep on paying the rent till a new tenant comes over and takes the place. 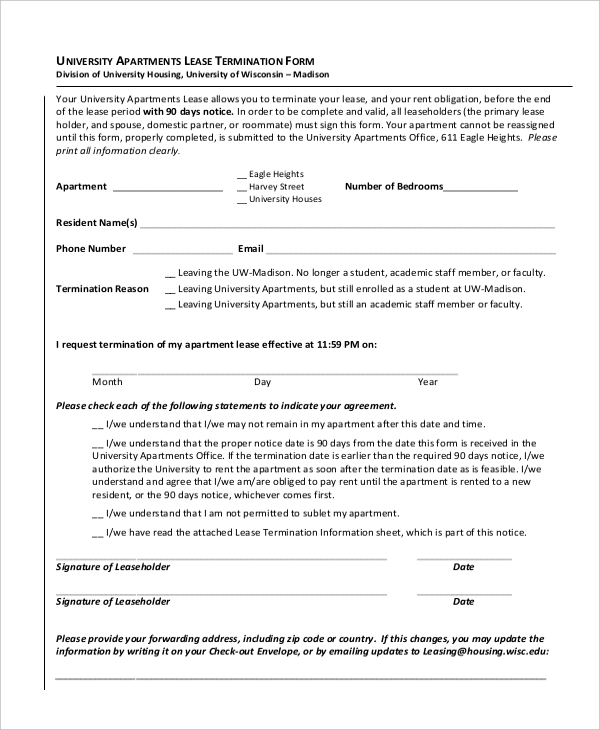 This form is useful when a tenant occupying a residential space has decided to give minimum period of notice to the landlord while ending the tenancy. 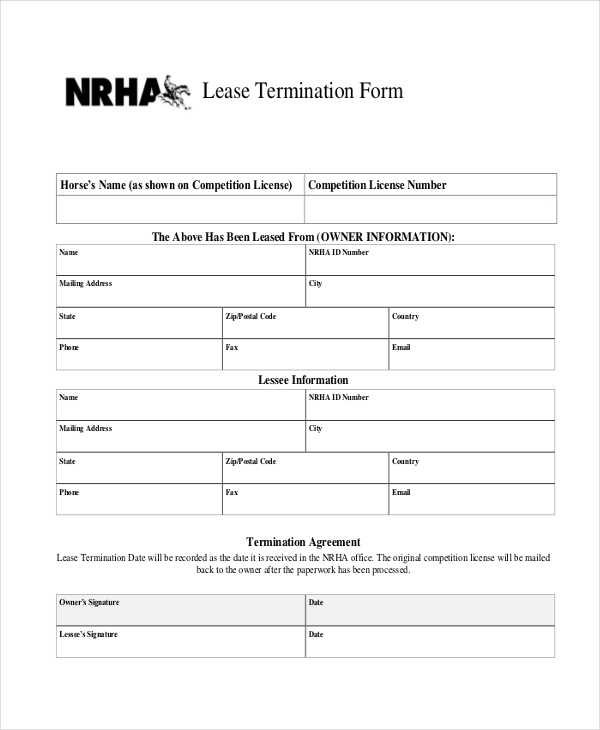 The form features the date of lease termination. This form is to be filled up by the tenant and the landlord both when the tenant wishes to make an early exit. He needs to make sure that the landlord is also okay with this early termination of a lease contract. The landlord can use this form against the tenant if the latter has failed to pay the agreed rent. A notice of 7 days will be given to the tenant as a warning. 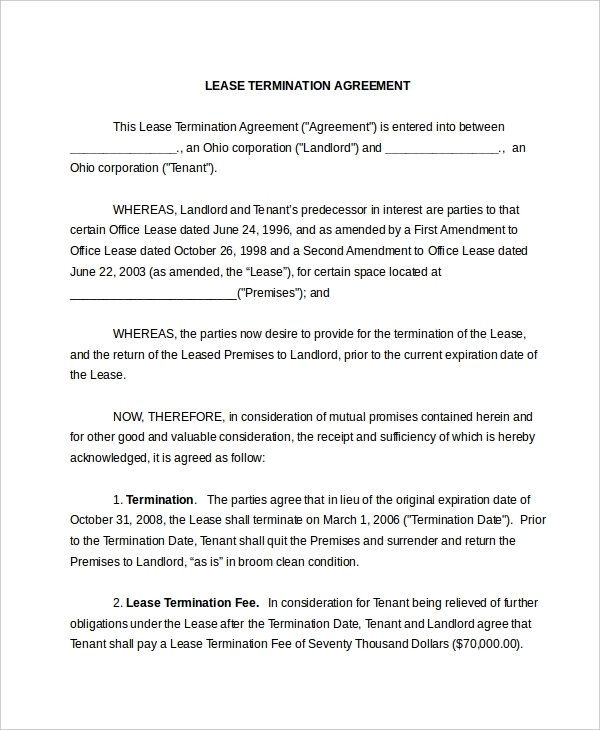 When is Lease Termination Form Needed? 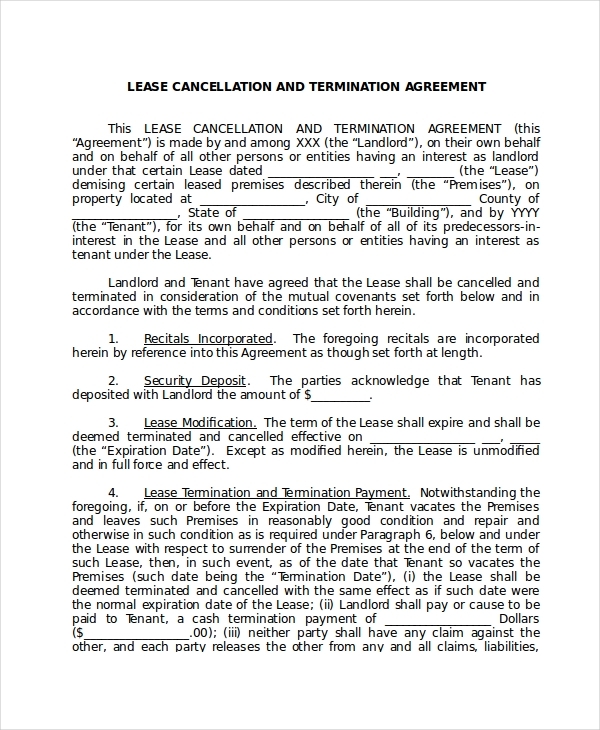 What Happens if the Lease Termination Form is Not Used? If you do not want to face the hassles of the court then do not risk it. The law acts in a very strict way if a tenant moves out of an apartment or a residency all of a sudden without informing the landlord in prior. Also it may happen that the landlord throws away its tenants illegally by without giving them any sort of an advanced warning. Such things can spoil a good relationship between two people and at times lands or spots of places are also lost. Law is there for a reason so make sure of the fact that you abide by it. 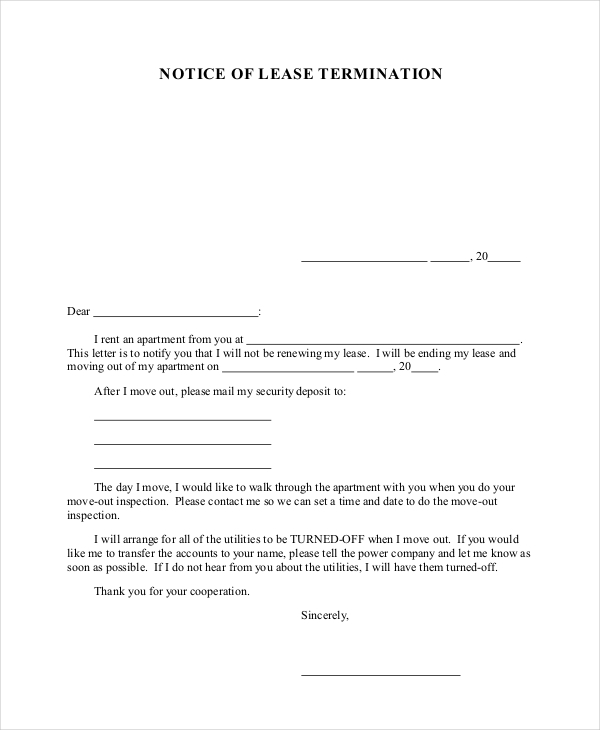 What Should You be Mentioning in a Lease Termination Form? 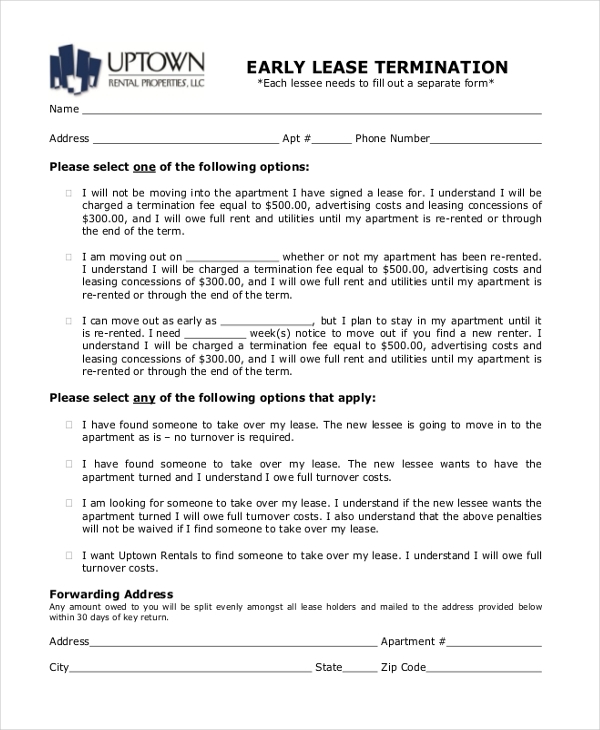 What is the Purpose of a Lease Termination Form? 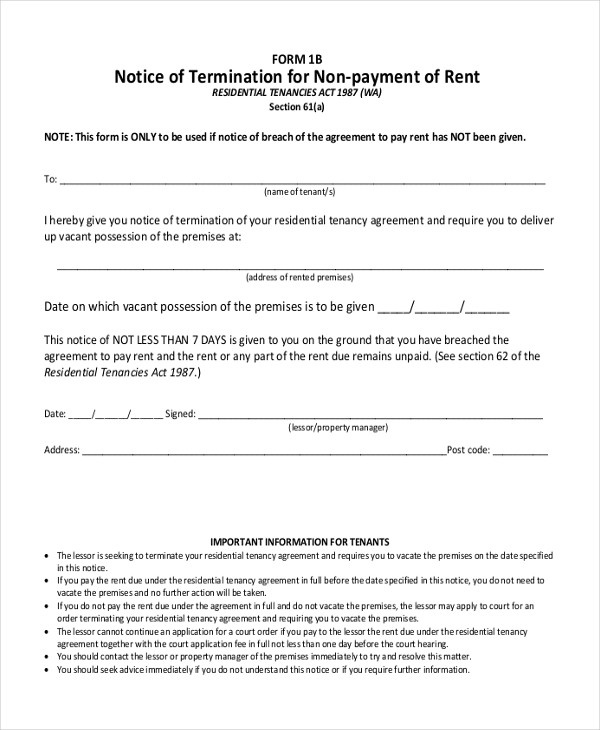 If you are a landlord looking to end the rental contract with your tenant, you must make the move official with a lease termination form. 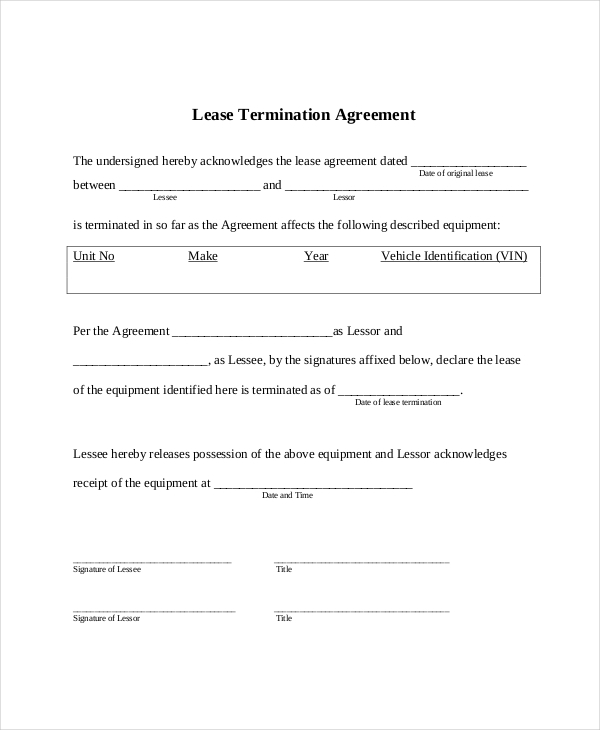 In case, you haven’t made such a form ever and need guidance on how to frame it, there are pre-designed and modifiable lease termination form templates to help you out.